It pays to shop around, and to do your research. There are a lot good, honest repair shops out there, and probably even a few dealerships – but it always pays to take what you’re told by a mechanic with a grain of salt until you’ve done your homework. Here are a few examples taken from personal experience. Hopping on the freeway in San Diego after a lovely vacation to Disneyland and Sea World with our little family of 5 in our Buick Skylark, whZZZzzzz, the transmission goes out. On the strength of a robust advertising campaign, we had our car towed to a local “Double A – beep beep! – M C O” dealer, where we were told that the entire transmission needed to be replaced: $2400.00, please. In 1987, that was not chump change by any means. Oh, and since they had already pulled the transmission, they wanted $750.00 to put it back in if we didn’t like their estimate. Results of research: After a bit of digging in the local Yellow Pages – alas, the Internet didn’t exist back then – we found Interstate Transmissions who came and towed our car, plus the transmission and appurtenant bits and pieces in a box – and put us back on the road for $1,200 with a lifetime warranty as well. A couple of years later the transmission failed again, and an equivalent shop in Utah honored the warranty, repairing the transmission at no cost. I also learned why AAMCO stands for “All Automatics Must Come Out,” and never gave them the time of day again. Savings: $1,200 or $2,400, depending on how you look at it. The price alone would have been enough to make me go do some research, even if my “BS-Meter” hadn’t already redlined. My hybrid battery finally gave up the ghost after 11 years. Toyota quoted me $3500.00 for a new hybrid battery. Meineke replaced the manifold gasket for me without charging me for parts because I had had it done last year there as well. That was good. Replacing the gasket didn’t solve the problem, though, and I was still getting a lot of noise and exhaust from up front. After some more analysis, technician says “Here’s where we start,” and shows me an estimate to replace my catalytic converter for $810.82. At this point, I figured that it was probably time to have it replaced, especially if I was considering selling the car. Toyota dealership quoted me around $2,600 for the job. Found a direct-fit converter online for $104.00, and a local mechanic installed it for me for $176.00. Savings: $2,320 or $530, depending. My rear wiper motor gave up the ghost; the local Toyota dealership at first declined to quote me a price for repair, saying – as they always do – “You’ll need to bring it in for a diagnostic.” Now, there’s a certain level at which this makes sense; you can’t really diagnose problems over the phone, especially when granny has a problem and the solution might be one of a dozen things. But in this case I knew what I wanted – a price to replace the motor. So they quoted me around $500.00, with the caveat that this would just be for the motor replacement ($146.00 for the part, $250.00 for labor), but if the problem was in the wiring or the switch, it could be a lot more, which I understand. Kinda. The takeaway from these experiences is always get a second opinion, and if you don’t like that one, get a third. Research parts and labor costs online, do what you can by yourself, and keep poking away at the issue for as much time as you have until you’re satisfied you’re getting an honest solution. ¹ Although, for the sake of reddit karma, I was really hoping I could get her to 280085. ² Some free advertising for the FIXD OBD-II Active Car Health Monitor: This little plug-in device monitors your car’s health continually and transmits information to an app on your phone. You can clear any codes with the tap of a button, and keep track of what may actually be wrong in your engine or exhaust system, saving you a lot of money for diagnostic charges (although a lot of auto parts stores will check your codes for free as well.) Best $60.00 I ever spent. I’ve written about the auto dealer “You’ve Won a Prize” scam before. 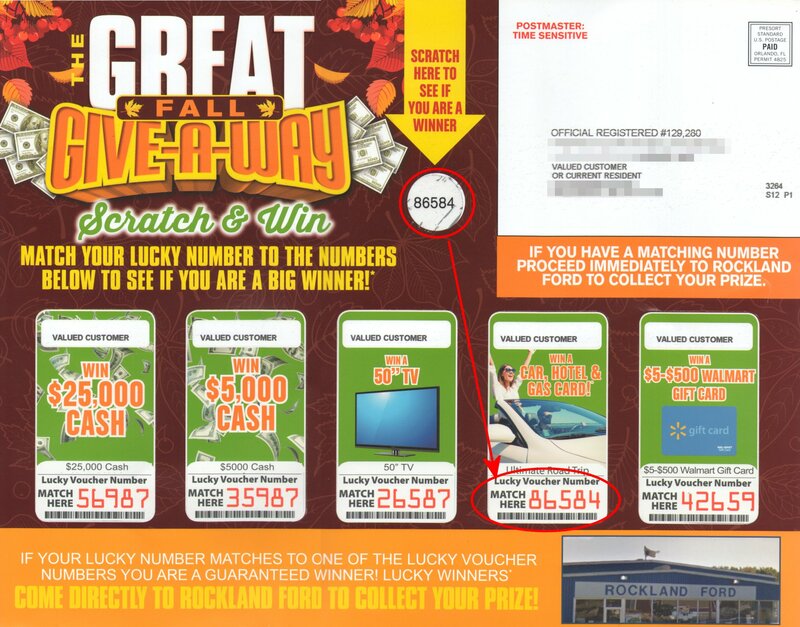 Today I happened to be driving past Rockland Ford in Thomaston, Maine with one of their flyers in my hand, and since a $5.00 WalMart gift card is better than a sharp stick in the eye if I’m in the area anyway, I dropped in. If you’re not sure, this means “the number you scratched off means nothing at all.” The only number that means anything is the one after “official registered #”, which in my case is 129,280. Odds of winning the WalMart gift card are 499,994:499,999, meaning that’s what you’ll get. Don’t be fooled into thinking it’s the $500.00 one. It isn’t. The salesman I spoke to insisted that the advert wasn’t deceptive at all, and I should just read the fine print. Well, I’ve lived long enough to know that bait-and-switch is a scummy tactic, and is usually covered up with the most barely-legal douchebaggery the attorneys can dig up. Yes, as long as the “final deal” is spelled out somewhere, they can claim that customers had access to all aspects of the promotion and it’s legal. But I ask you: how many people walk away from the encounter disappointed and with a sour taste in their mouth about the dealership? How likely are they to want to buy a car from a dealer that uses such tactics to get people in the door? People who run these enterprises ought to give that a thought. Working “for the exposure” – an Open Letter to Elon Musk. Make no mistake about it – I’m a fan. You have done and continue to do amazing things with technology, which will benefit humanity in incalculable ways as things only continue to improve. I’m putting “Unicorngate” down to a simple lack of awareness of what happens on the ground to virtually countless artists, writers, web designers, composers, photographers, playwrights, and so many others who depend on their sweat and blood and tears and creativity to make a living. Tom Edwards is one such, and intriguingly enough from all I’ve read, he remains a fan of your efforts. Ask any creative soul – they’ve probably been asked to work for free. One of the best essays on the subject I’ve seen includes illustrations by Emmie Tsumura, who imagines the faces of people who want you to work “for exposure.” I recommend the piece. These people probably fall into one of two categories: Cheap bastards, and the totally unaware. Mr. Musk, I don’t know you from Adam’s off-ox, but you don’t strike me as falling into the first category. I suspect that what happened is that somewhere in your organization, someone who wasn’t even thinking about copyright violations thought Tom Edwards’ work would make a good bit of marketing fluff, and before you or anyone else at the top was aware, it had been incorporated at multiple levels. The right thing to do would have been to compensate Mr. Edwards fairly for the privilege of continuing to use his work, or to apologize for the error, pull the illustration from your materials, compensate him fairly anyway, and move on. Don’t be that guy. Your company can afford to pay people fairly for their work. The optics of doubling down on an issue where you’re clearly taking the wrong position are terrible, and the world needs Tesla to look good.